It’s officially fall which means it’s about that time again.. and by “that time” I mean the time of year where it’s socially acceptable to eat, sleep and breathe pumpkin spiced everything. Except for Starbucks pumpkin spiced latte’s because ain’t no body got time for artificial ingredients and 50 grams of sugar in one drink. I thought I’d kick off the pumpkin spiced season with a recipe that is easy to make, full of nutrients and perfect for meal prep for breakfast or snacks to take on the go since I know a lot of us are still getting back into the swing of things. I figured that we could all use one less thing to worry about in the morning since most of us could use all the time we can get to peel ourselves out of bed and attempt to make ourselves presentable.. Sometimes adulting is hard - don’t worry, I feel you. 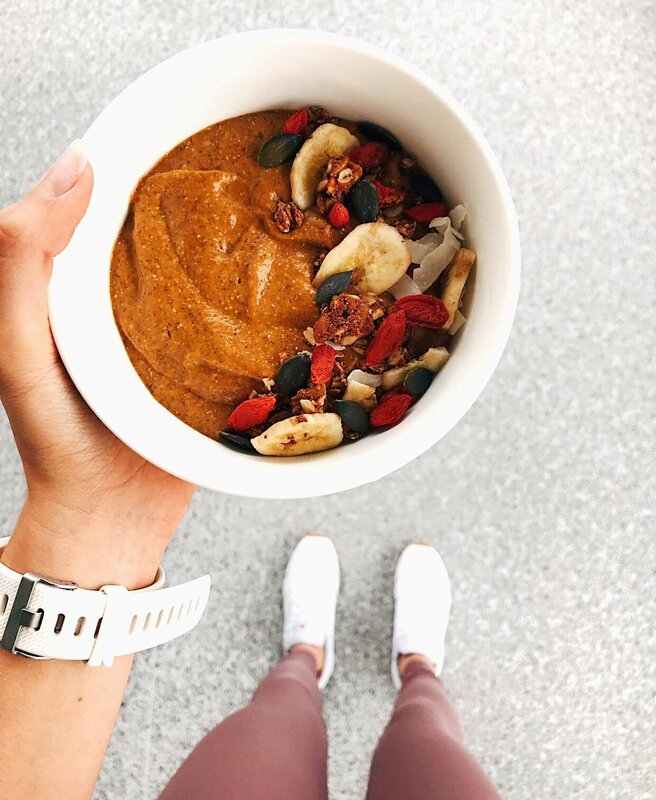 This chia pudding is full of plant based protein, healthy fats, fibre and tons of nutrients from the pumpkin. Oh and did I mention that it basically tastes like healthy pumpkin pie filling? Because it does - it’s pretty legit..
Add all wet ingredients to a medium sized container and whisk until fully combined. Stir in all dry ingredients and mix until combined - mixture should be thick. Allow to sit at room temp for 5-10 minutes until chia seeds start to gel. Add mixture into a high power blender and blend on high for 60 seconds, until no seeds are visible. Transfer mixture back to container and place in fridge for 1 hour MINIMUM. Serve with fruit, granola, nuts, more almond butter - whatever your heart desires!